The Oakley Sound Systems ADR30 is an analogue delay module that processes audio signals to create echo and chorus effects. 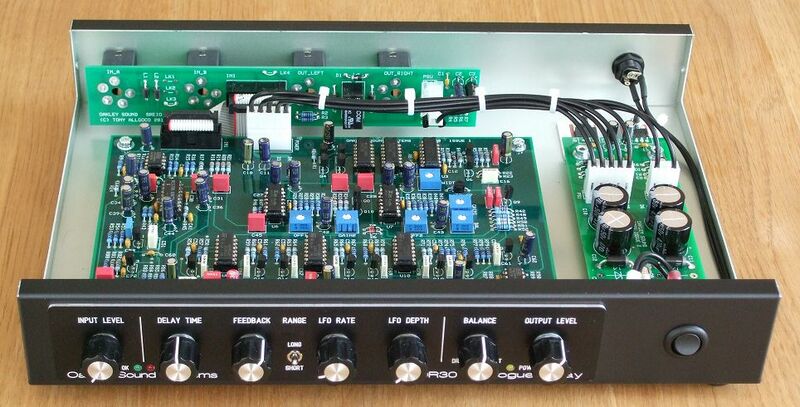 It uses two Xvive MN3005 bucket brigade delay (BBD) integrated circuits to produce a very distinct 'vintage' sound. 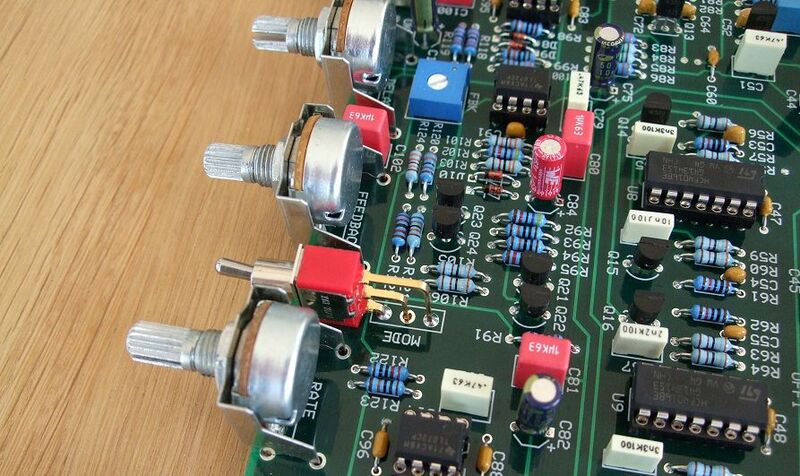 Classic companding noise reduction circuitry further adds to the sonic characteristics. The four layer PCB is available now. It's designed to be half rack sized so in theory two could be placed side by side in a 1U rack. I've built my single unit prototype in a low cost Takachi YM-300 case. I'll be updating this page in the next day or two with some sound samples and pictures of my prototype. Nice one , I hope there is demand for the 1/2 rack format. I hope there is demand for the 1/2 rack format. Half rack is great. Though I don't expect demand to be high. My most popular project, apart from the 5U ADSR, was the TM3030 and that was half rack. It beat the earlier TB3031 which was the expanded full rack width version. I think some folk like the half rack format as it allows them to fit it into a full width rack with space for I/O or other stuff on the front, it also allows one to build a desktop unit with the pots mounted off board and on the top surface without too much hassle, and it also allows one to build it into the many smaller project boxes, like the YM-300 I'm using. I also like it as the PCB is just small enough to fit into a 'large letter' package to send safely in the post. The boxes for the 19" Filtrex and SRE330 projects are expensive to buy and send. A eurorack version in surface mount would be a possibility but I've got other things to finish first. I went to the website (via the link you provided), read it all, listened to it all. Nicely done. The included LFO and it's influence generated a question ... is there a simple enough method or modification to add a CV input that would defeat the LFO, (perhaps a switching jack) so an outboard envelope generator could be used in it's place? Or even a velocity signal so that harder key strikes would modulate the repeat rate (or even the feedback level)? Or am I speaking of a total redesign, which is obviously out of the question? I hope the demand for all your boards is solid of course. Woooow... The sound examples are so close to my WAD. Pretty amazing delay man!! Will definitely be building at least one. Would be cool to see some more Oakley half racks to fill out the other side Your stuff has really been sounding amazing lately! 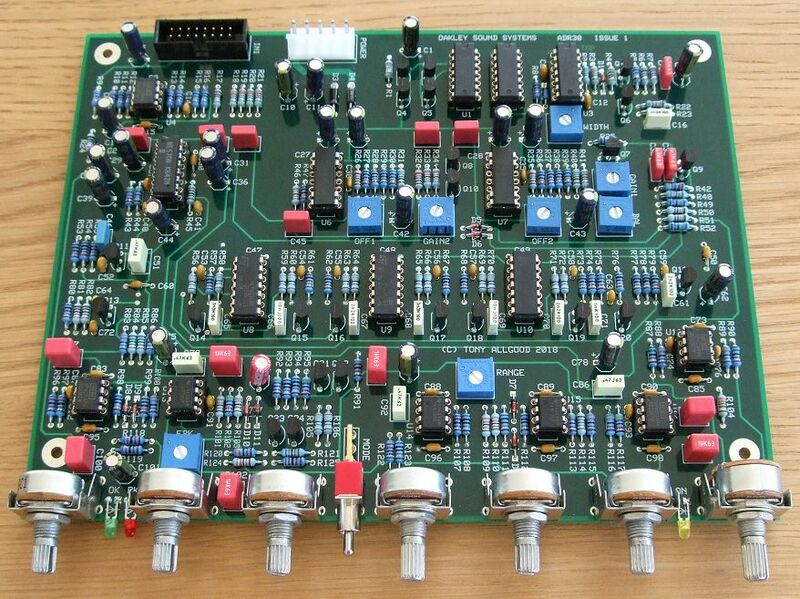 Just to let folk know I have some more ADR30 boards coming from the factory tomorrow. If you would like one then please let me know via e-mail. couldn't resist and just sent you an e-mail . I remember you musing that this might one day make the jump to 5U, I expect you are too busy with that now, but how difficult would it be to 'roll your own' 5U implementation? It's on the 'to do' list but as to when I'll get to it is another thing entirely. I'd like to have a go this year though. It will probably be a double width module though and not a single like the Flanger/Chorus. You could try getting it to fit but the board is too big to sit against the panel directly so you'd have to have it side ways on with one of the short sides parallel to the panel and use some sort of L bracket. It will run from +/-15V but you'll need a different connector than your standard MOTM or MU one. Does anyone know a reliable source in Europe (preferably even Germany) that carries the Xvive MN3005 and has them in stock? Banzai and Musikding have them listed, but both are out of stock, and based on previous experience (as in, I waited for several months) I'd rather buy from someone who has them at hand and can ship them in time. Edit: I ordered from the US in the meantime when I found a seller (authorized distributor for Xvive, Coolaudio and other) who ships at a really reasonable rate of less than 4 USD for the two chips I need. I ordered from the US in the meantime when I found a seller (authorized distributor for Xvive, Coolaudio and other) who ships at a really reasonable rate of less than 4 USD for the two chips I need. I've just ordered some Xvive MN3007s from them today. You seem to be a clairvoyant . In other words: Yes. And, btw. I picked up the PCB package from my local post/mail office today . Useful to know! Also hit them up for a small handful of chips. The recommended Takachi enclosure is apparently unobtainium here, and I couldn't find a similar alternative yet. There is one case labeled "GSS08", but it's more than twice as high. Might be a good choice if you want to build two units and stack them, though. And this one, which is almost twice as expensive. I'll post it here if I find some other solution, but as of now, I haven't found anything that really compares to the Takachi YM-300 concerning size, material and cost. There is a case "Universal-Gehäuse GSS04" similar to the GSS08 mentioned above, but somewhat smaller - 250 mm * 200 mm * 70 mm. I hope I can get everything inside, although it'll get a bit narrow. Anyway, I just ordered one of these cases off German Ebay (just under 20 Euros with free shipping) and will keep you informed when I'm actually building the unit. A smaller version of the RPSU PCB for those who use a single phase AC wall wart as recommended might be a good idea though (?). I hope I can get everything inside, although it'll get a bit narrow. By now, all resistors (except for the 16k, which I had to order), most of the diodes and most of the IC sockets are in place (main board, that is). The SRIO and RPSU boards are also partly populated (what I had at home; a few caps, sockets, the relay and the LM337 are still missing). I'll (have to) mount the RPSU board kinda 'upside down' or 'hanging from the ceiling'. That way, eveything will fit in and the LM317/LM337 can lay flat using the case itself as a heat sink. The only (but minor, imho) drawback is that there'll be a few screw heads on top of the case, but that's OK for me. … 'roll your own' 5U implementation? Any news on the 5U version of the delay? Love your modules, great building experience! Nothing yet. I'm still not sure whether to do a MOTM or MU format of the module as it will have to be a double width module to get all the circuitry behind the panel. Once any module goes to double width it's best to design for one or the other format because of the additional width of the MU panels. A DIY and perhaps a ready made MU one may be a better option given the increased popularity of the MU format these days. A single width panel could be done if the circuitry was surface mount but the only surface mount board I have - the 5U Flanger/Chorus - hasn't sold well at all. IMHO a 2U version, perhaps with more CV possibilities than the standalone version would be ideal. perhaps another option would be to stack 2 PCBs using arrays of pin headers (male on one, female on the other), like you did with the ASV build. and a common audio PCB on top for both versions, also with accessible calibration trimmers. A third PCB for the Jacks due to the high differences. Regarding support for MU and MOTM, perhaps another option would be to stack 2 PCBs using arrays of pin headers (male on one, female on the other), like you did with the ASV build. Yes, this is way I'd probably do it. But the MU would be wider which gives me more scope for extra inputs and controls compared to the narrower MOTM. Single width MOTM modules look fine when stretched to 1MU, but double width MOTM modules look a little empty when stretched out to 2MU. That extra space is aching for more features - which means that the core design would probably be different. It's not impossible to have a common main board with the core features of both and then have all the MU extras on a specific MU pot board though. I'll think about it. Currently working on a sequencer though so it may be some time. Should we start a separate build thread for sharing pictures, build related questions, remarks and such, or shall we just use this one? Or the ADR30 thread in the Oakley subforum? Wow cool, looking forward to details about that one! Should we start a separate build thread for sharing pictures, build related questions, remarks and such, or shall we just use this one? Feel free to use this one. I shall endeavour to visit whenever there's a new post.